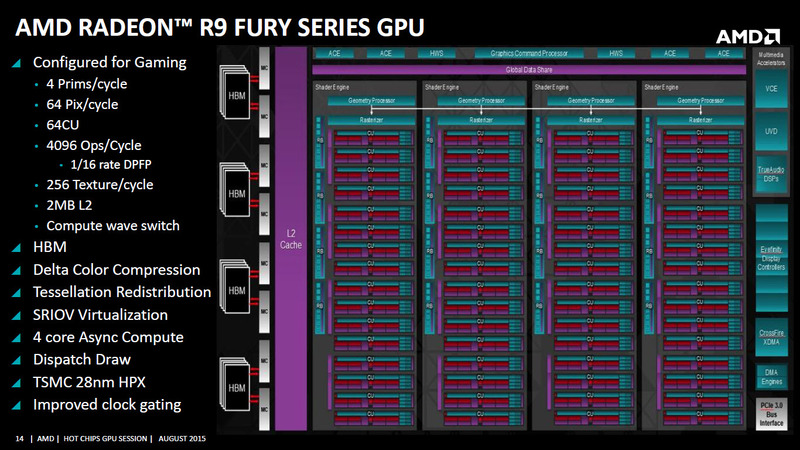 AMD have revealed the first performance numbers of their R9 Nano graphics cards during the Hot Chips conference. The High Bandwidth Memory powered GPU beats the R9 290X in frame rates – an impressive feat considering just how small the entire card is. The Radeon R9 Nano is probably the most exciting of AMD’s new GPU line-up, serving to be an amazing demonstration of what can be achieved with HBM. The amount of memory bandwidth and shear amount of RAM could never be crammed into such a small space with conventional GDDR5 memory. The Nano uses the same Fiji silicone as found in the R9 Fury X, and still sports the same 4GB of HBM and 512GB/s of bandwidth thanks to its 1024-bit interface which is clocked at 500 MHz. The Nano is twice as efficient per watt as the Hawaii (the R9 290X), thanks to the full Fiji GPU core featuring 4096 Stream Processors (shaders), 256 Texture Mapping Units and 64 ROPS wrapped up in 2MB of Level 2 cache. Core clock speeds are reduced to fit in with the Small Form Factor (SFF) design and the 175W envelope. This means just one 8-pin power connector is required for the Nano. The Radeon R9 Nano naturally comes with all of the new technologies found in AMD’s Fiji core, including Delta Color Compression, Tessellation re-distribution, improvements in clock gating and SRIOV virtualization. Just as importantly for compute tasks, the Nano comes equipped with 4 Asynchronous Compute Units (ACE). For those who’re unfamiliar with what an ACE is, it is used to schedule compute and graphics work on the shader cores. AMD are heavily banking on a compute feature for games, and have shown that using their ACE’s in DirectX 12 can improve performance in games by about 46%. Checkout our analysis and interview here for more information! The performance numbers of the R9 Nano speaks for themselves – with the frame rate of the mini graphics card sitting between the R9 Fury X and the R9 290X. 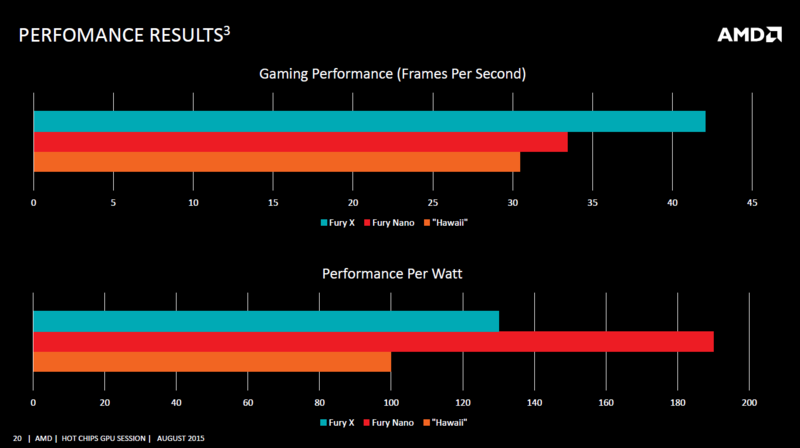 The R9 290X manages 30.5 FPS, while the Nano hits 33 FPS, the Fury X sits at 42 FPS, demonstrating a clear performance hierarchy. AMD have been prototyping High Bandwidth Memory (HBM) since early 2014, but had originally started toying around with on-chip memory solutions in 2007. Back then of course HBM wasn’t thought of, and instead they were using GDDR3 only. AMD’s Robert Hallock had previously told us some details of how AMD became involved with HBM, so checkout our interview if you want more info! This article was filed under Articles, Features, Hardware, PC Gaming News, Tech News. Tagged with AMD, DirectX 12, DX12, fury x.nano, high bandwidth memory, r9 nano, radeon.